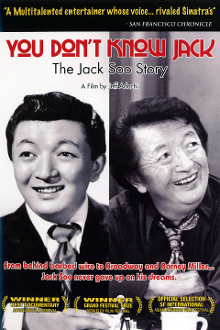 "You Don't Know Jack: The Jack Soo Story" tells the fascinating story of a pioneering American entertainer Jack Soo, who became the first Asian American actor to be cast in as a lead in a regular television series "Valentine's Day" (1963) and later starred in the popular comedy show "Barney Miller" (1975-78) The film features rare footage and interviews with Soo's co-stars and friends, including actors George Takei ("The Green Berets"), Nancy Kwan ("Flower Drum Song") and Max Gail ("Barney Miller"), comedians Steve Landesberg, and producer Hal Kanter ("Valentine's Day"). The film also explores why Soo, a Japanese American who was interned during WWII, changed his name to avoid post-war racial discrimination and how he used his experiences to create his unique brand of comedy. Directed by Jeff Adachi ("The Slanted Screen"), "You Don't Know Jack" reveals how Jack Soo helped lay the groundwork for today's generation of Asian actors and comedians.